Here we go. Saint Germain-des-Prés, 5 rue Sébastien-Bottin. This has been the address of the publishing house Gallimard since 1929, who’s founder Gaston Gallimard used to say: “I’m not a trader as another, I made a pact with the spirit.” But don’t look for this address anymore. On the occasion of its 100th anniversary the street has changed its name. From now on a small part of the street is called rue Gallimard. 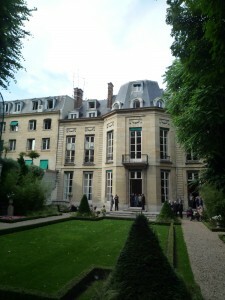 Here, at number 5, a hôtel particulier is located , a typical Parisian mansion which, I have to admit, looks quite modest from outside. Once inside, you quickly change your mind: parquet flooring, stucco on the ceilings, golden mirrors over marble fireplace. This is definitely a place where a writer must feel in heaven. And it is a kind of heaven. This is the Mount Olympus of French culture. You can’t climb higher when dealing only with words. Imagine who has been lingering around here: Marcel Proust, Jean-Paul Sartre, Albert Camus, Simone de Beauvoir, all the bigwigs of French literature. But there was also Joyce, Nabokov, Fitzgerald and Hemingway you name it. Strangely you can still feel their presence here. And if not, just remember this: all together, the Gallimard authors have been awarded 36 Nobel Prizes and 35 times with the Prix Goncourt, the most important of the French literary prizes. There is an old photo from the time when Gallimard moved in here in 1929 showing the "author's room" equipped with “writing tables, telephones, good armchairs, a bar and a view of the garden", as Gaston Gallimard explained back then in a letter. The photo shows the likes of Camus, Queneau and Paulhan deeply sunk into the brown leather of the fauteuils club. You can tell: they all feel important and smart. 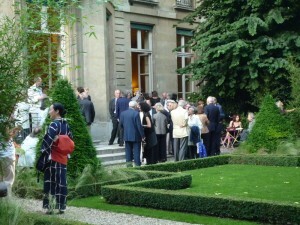 “A bar and a view of the garden”, said Gallimard. And what a garden! 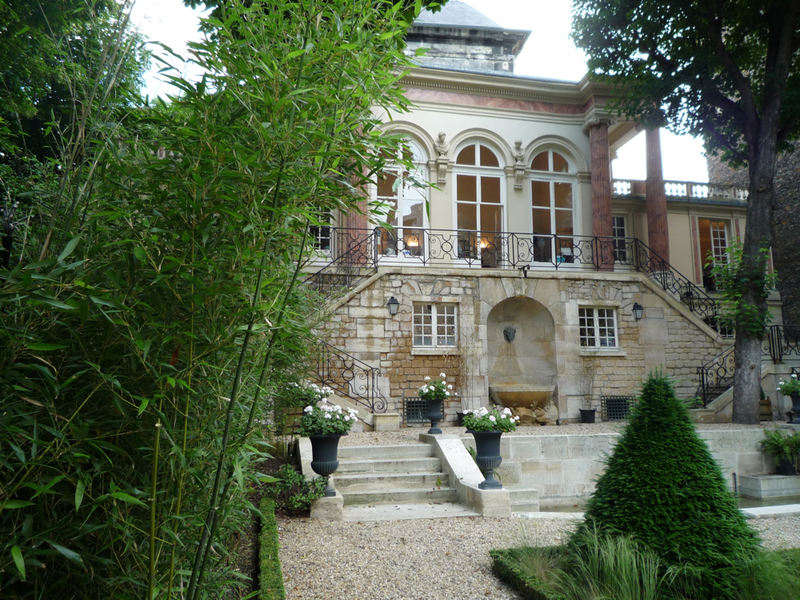 This is the most stunning thing at Gallimard: the floor to ceiling windows of the mansion open directly onto nature. Once you walk into this garden, you’ll pinch yourself: is this Paris? Is this the very heart of the city where on every square metre buildings have been shooting up like mushrooms as long as anyone can remember? Oh yes, and it’s a classical French garden where nature has been tamed by a ruler. At the back of the garden another house is located. It looks like a miniature of a chateau. Small girls dressed like little princesses were posing on the staircase the night I was there. Everything looked a bit unreal. Like the setting of a novel. Maybe Proust.